In the left pane of the file manager window, open the directory in your computer's file system in which you want to restore a file or folder. In the right pane of the file manager window, open the directory that contains the file or folder in the backup that you want to restore. Select the file or folder that you want to restore and press F5. In the Copy dialog window, review the file or folder copy settings, select Ok and press Enter. 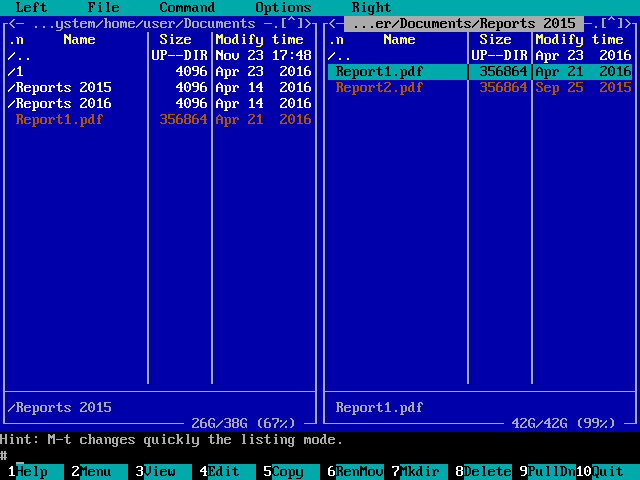 Midnight Commander will save the file or folder to the specified location. After you finish working with files and folders, press F10 to close the file manager.